Friday, 8 PM. 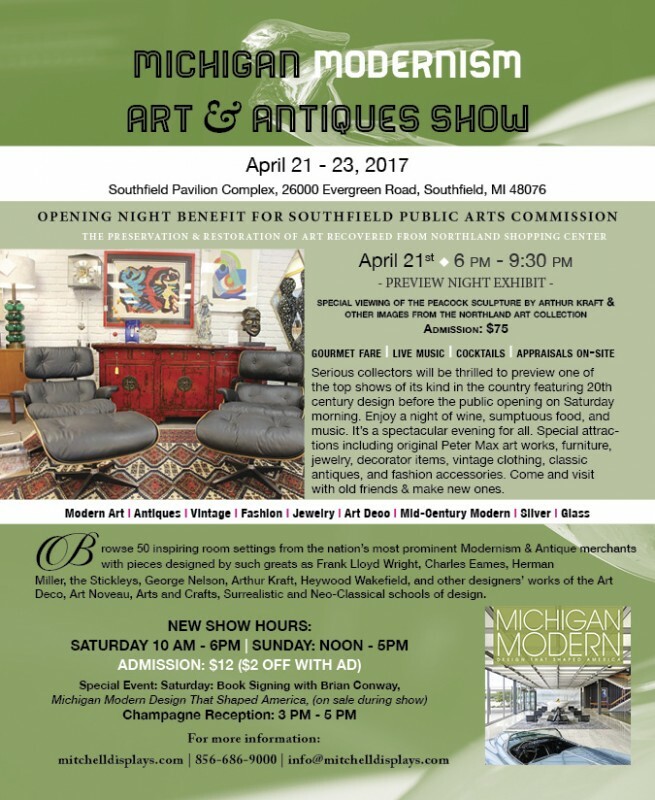 I’m starting to write this post on Friday night from the preview party of the 2017 Michigan Modernism Art & Antiques Show. Silly me thinking I might sell something at a preview party. I should have hired a booth sitter and gone to the movies instead. The show opens tomorrow morning at 10 AM. Got my fingers crossed. UPDATE: Saturday, 4 PM. Attendance has been moderate all day, with decent interest, but only one good sale. Thanks to the client who made my day. I know you read my blog. UPDATE: Sunday, 6 PM. The show is over and I’m disappointed. We made one small sale today and not much else happened. Two sales do not a show make. We just about broke even. I do see the possibility for better business at this show down the road, so we’re going to sign up for the October, 2017 edition. If we don’t see improvement, that will be it for Michigan. The show is very pleasant to do. The space is comfortable, airy and well lit (but that’s actually a minus for a lamp dealer). The show promoter, Bob Bockius, has bent over backwards to please the dealers and the public, including free wine and beer. Here’s wishing him and the show good luck. 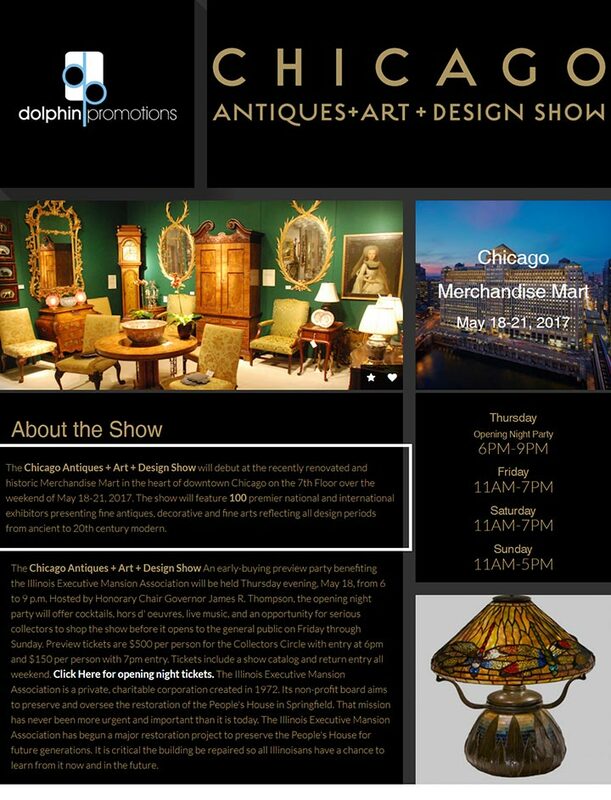 I’m really looking forward to our next show, the revived Chicago Antiques + Art + Design Show at the Chicago Merchandise Mart. I was quite sad when it folded a few years ago as it was always one of my favorite shows. The new edition will have a new promoter, Dolphin Promotions, headed by Rosemary Krieger. There hasn’t been an antique show in downtown Chicago for several years, so I’m hoping this one will be met with a lot of enthusiasm. The show runs from May 18-21, 2017. 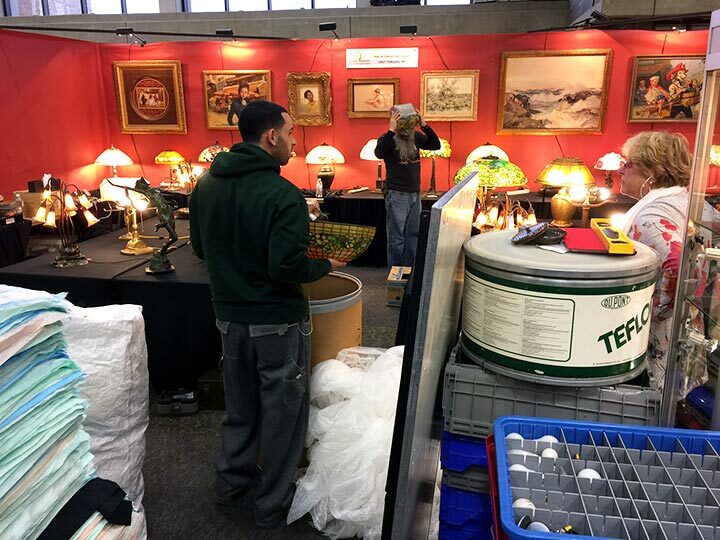 Yesterday we spent the entire day setting up at the 2017 Michigan Modernism Art & Antiques Show in Southfield. It went very well for a variety of reasons including 1. We unloaded and set up the showcases on Wednesday. 2. We had an additional person helping, so there were four of us. 3. We had a huge booth, so we weren’t stepping all over each other. We finished in one day, which was quite an accomplishment. We’ll have the day off today, Friday, but we have to come back for the preview party this evening, 6:00 – 9:30 PM. I really hate preview parties, but I have a funny feeling that we might do some business at this party. I’ve got my fingers crossed. 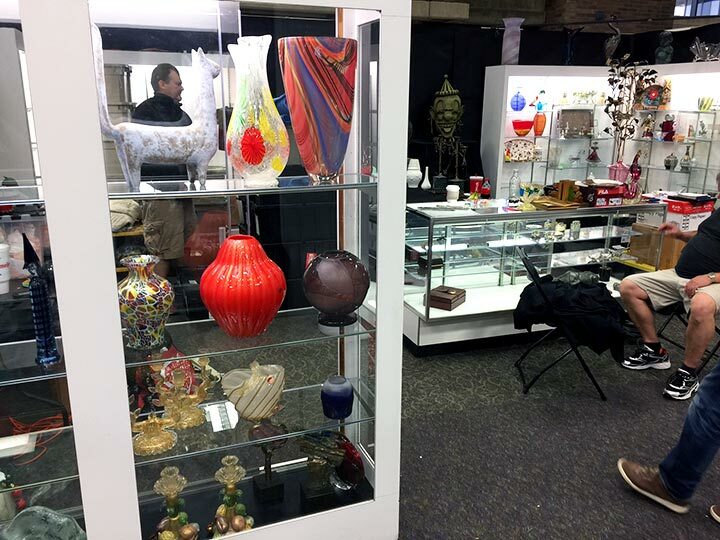 We set up a killer booth, with the best assortment of French and American glass and lamps that we’ve ever brought. With the huge amount of space, we were able to set up a great booth with everything showing well. It looks great! We’re set to have a fabulous show if the buying public cooperates. If the show goes well, we’ll be thrilled to return. If it’s a bomb, goodbye Michigan. The show opens to the public this Saturday at 10 AM and continues until Sunday at 5 PM. Please visit the show and do your part. If you want me to return, pay me a visit. Thanking you in advance!! Click here for more information. Thursday’s post will be delayed until Friday as setup in Southfield, MI doesn’t start until Thursday. 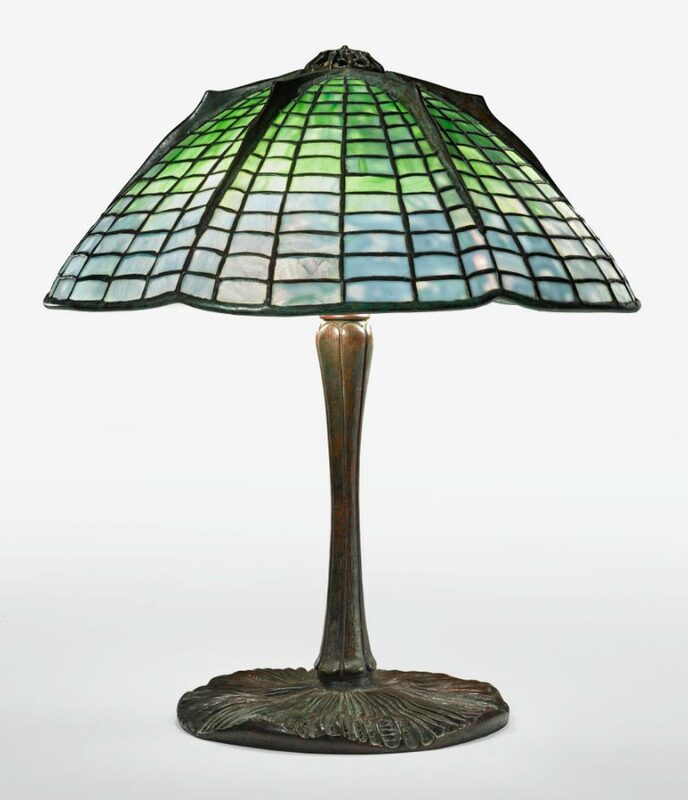 We’re bringing one of the strongest inventories we’ve ever carried, including an amazing selection of French and American glass and lamps by Tiffany Studios, Handel, Pairpoint, Daum Nancy and Gallé, to name a few. 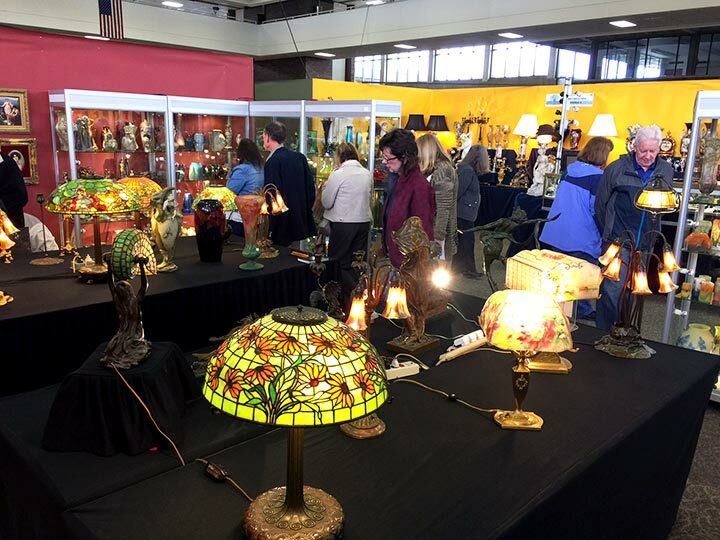 The dealer list will include important dealers with beautiful displays, including Alan & Adele Grodsky, Myers-Huffman Antiques, Del Giudice Antiques and Ray Kisber. For the complete list of dealers, click here. If you’re anywhere in the greater Detroit area, it will be worth your while visiting the show. Click here for more information. I hope to see you there. Brunk Auctions, Asheville, NC, held a diversified sale on March 24th and 25th, 2017. 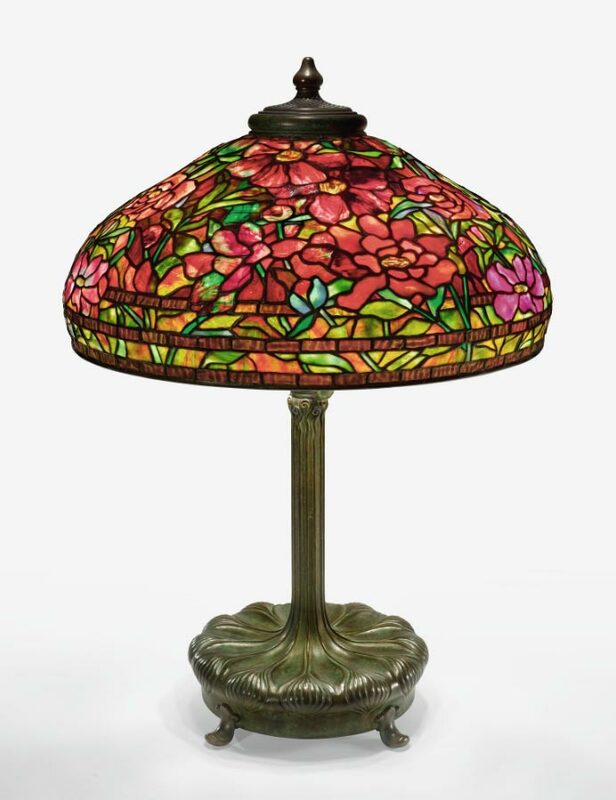 Included in the sale were a Tiffany Studios chandelier, a Colinet bronze and three French cameo glass vases among the 910 lots offered for sale. The results varied greatly. 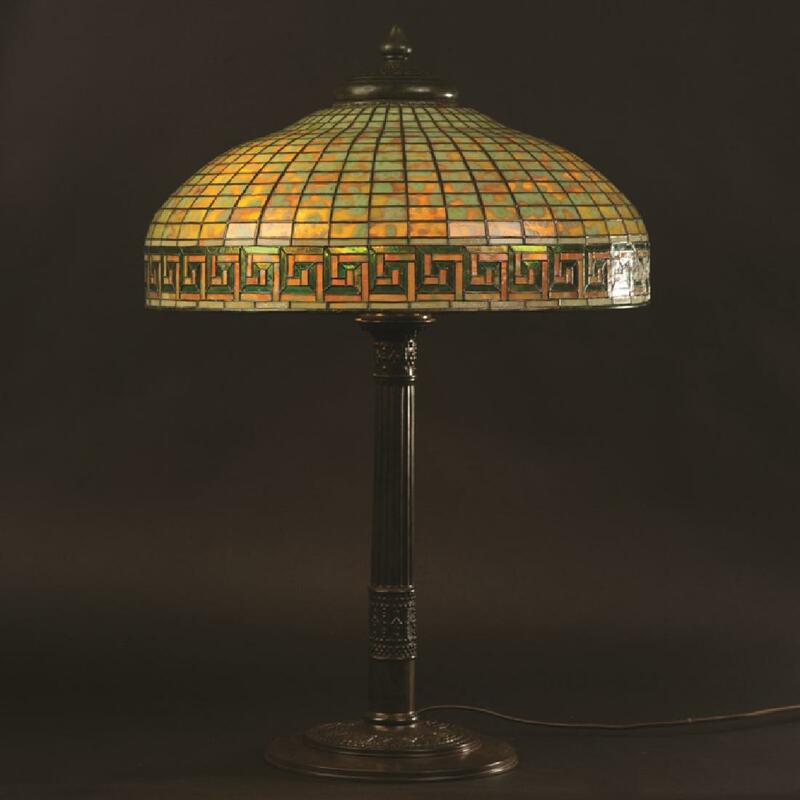 The unsigned, 24″ diameter, Tiffany Studios Turtleback chandelier sold well, even with a few problems, such as three new sockets, a replaced ceiling cap, and seven cracked panels. 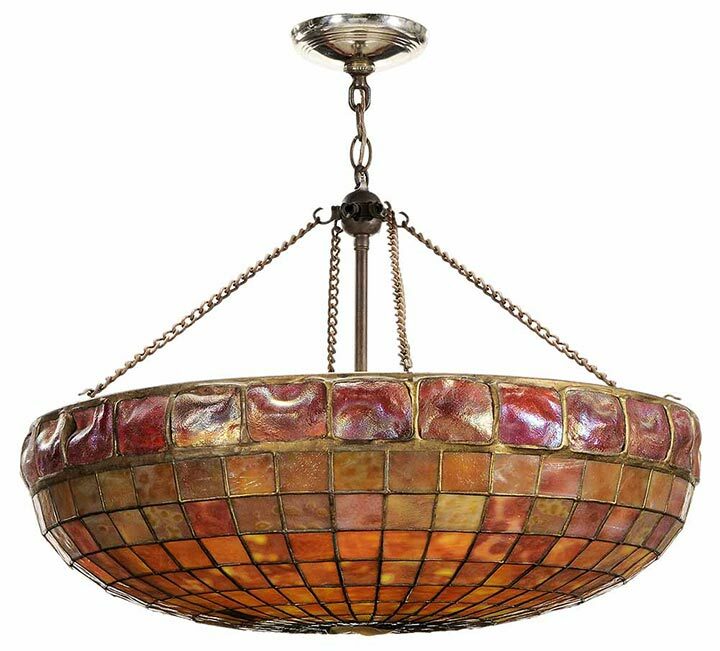 In its favor were reddish turtleback tiles and nice mottled glass. 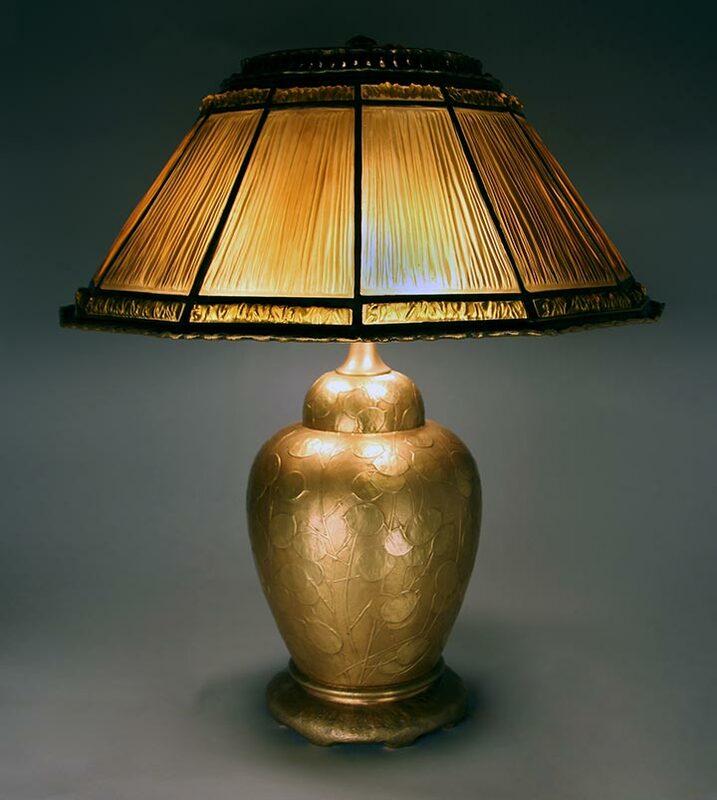 It sold for $36,000, including buyer’s premium, against a pre-sale estimate of $15,000 – $25,000. 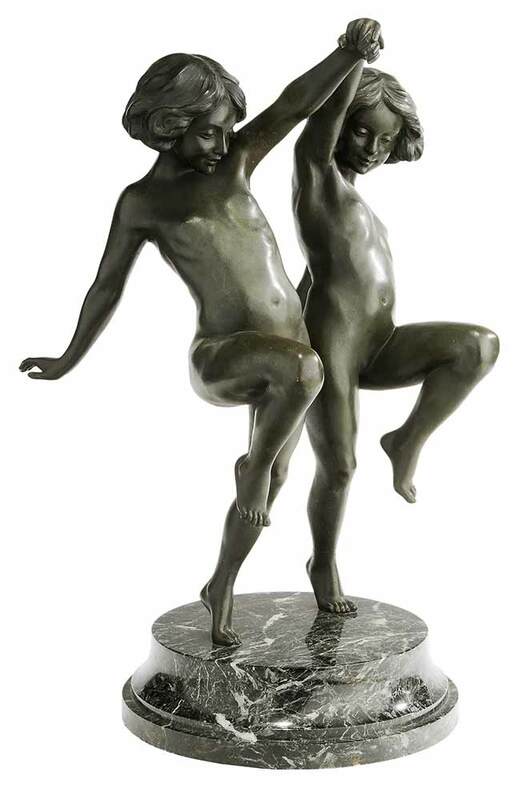 Lot #327, a Claire Colinet French bronze of dancing children, 23″ tall, was featured on the inside cover of the catalog. 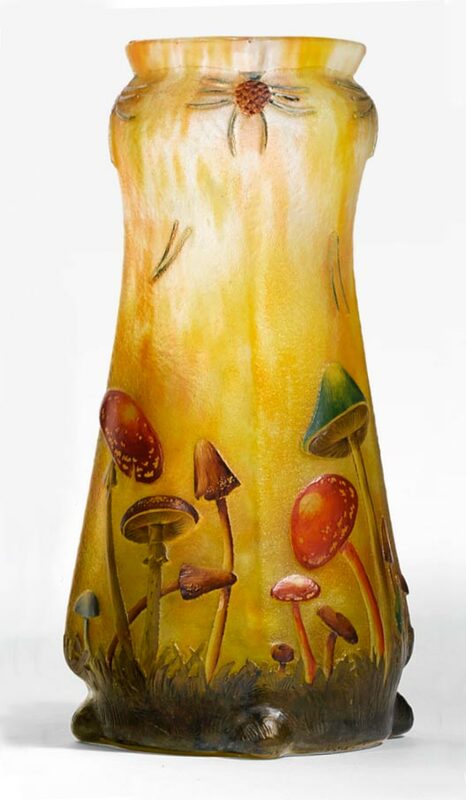 It sold for $3,360, including buyer’s premium, above its high estimate of $2,500. I was busy during the sale, so I never bid, but I think I would have bought it if I had participated. 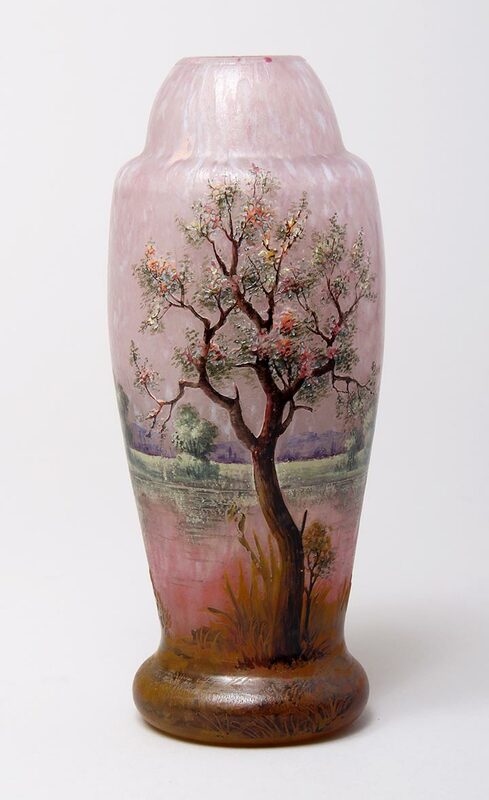 The three French cameo glass lots, #s 10-12, were two acid-etched-only Daum vases and one low quality Gallé vase. They all sold at or below their low estimates. I wouldn’t have bought them at any price. For the complete results, click here. 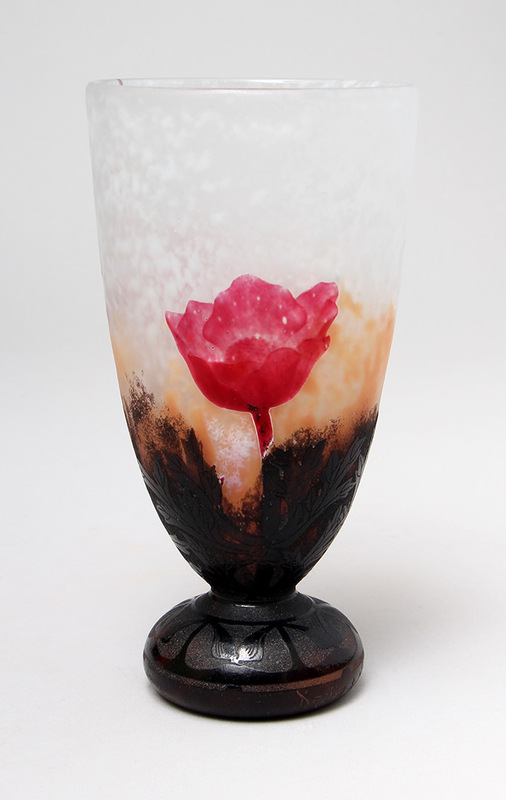 There were glitches with the website, so it was difficult to use, but you can try. We haven’t exhibited in the greater Detroit area in over 10 years, but at the encouragement of a fellow dealer, we’ve decided to give it another shot. I enjoyed doing the show years ago and hope that business is good so we can add it to our regular schedule. The show opens next week with a preview party on Friday, April 21st and continues until Sunday, April 23rd at 5 PM. I hope you can make it.